I loved looking through these photos over the last couple of days while writing this post! 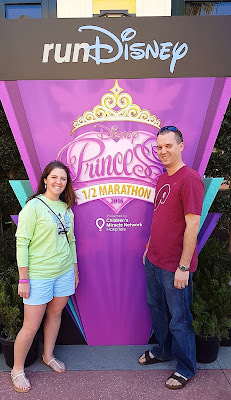 Mike and I had a fantastic time during our whole trip to Disney (here's the recap of the parks), but the Princess Half marathon weekend was definitely a high point. I had never run this much in one weekend (19.3 miles) or had the opportunity to run with Mike (FYI - happy belated birthday to him - the big 3-0 yesterday!). 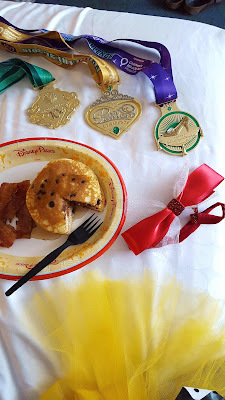 This was my 4th runDisney weekend; my previous races were the Walt Disney World Half in 2012, as well as the Tinker Bell Half and Wine and Dine Half for the Coast to Coast medal in 2013. The Princess weekend had always been on my bucket list, so now living only a few short hours away, it seemed like the perfect opportunity to run another race. Plus, training in Charleston over the winter was much easier than my previous trainings in New England! 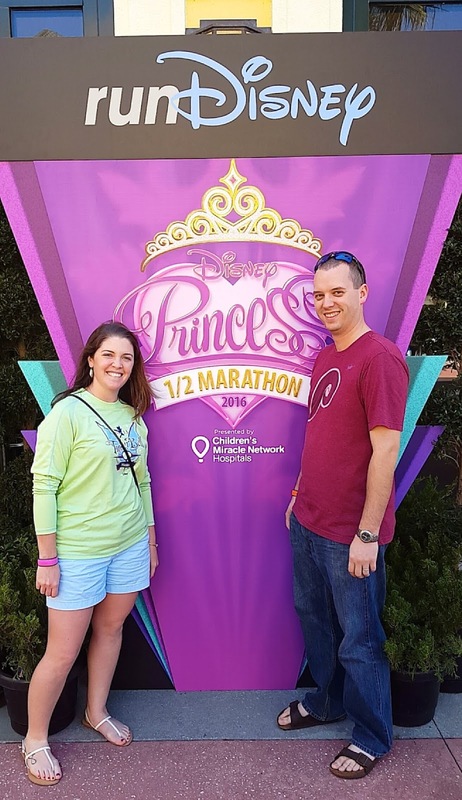 Mike and I arrived to Disney World on Thursday afternoon and headed straight to the Wide World of Sports for the Expo. Apparently we missed the whole first-morning rush and didn't have to wait in a single line to print waivers (left ours on the printer at home - haha! ), pick up race bibs, or even at merchandise check out (they had also replenished all the stock so nothing was sold out)! I was good this time and didn't buy a million things I didn't need (like I've done in the past). A 19.3 magnet, 19.3 headband, pair of favorite compression running shorts with the Princess Half logo, and pins for each 3 medals were my souvenirs of choice. 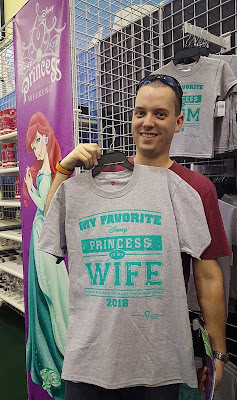 No, Mike did not buy that shirt, but we did get a kick out of it! 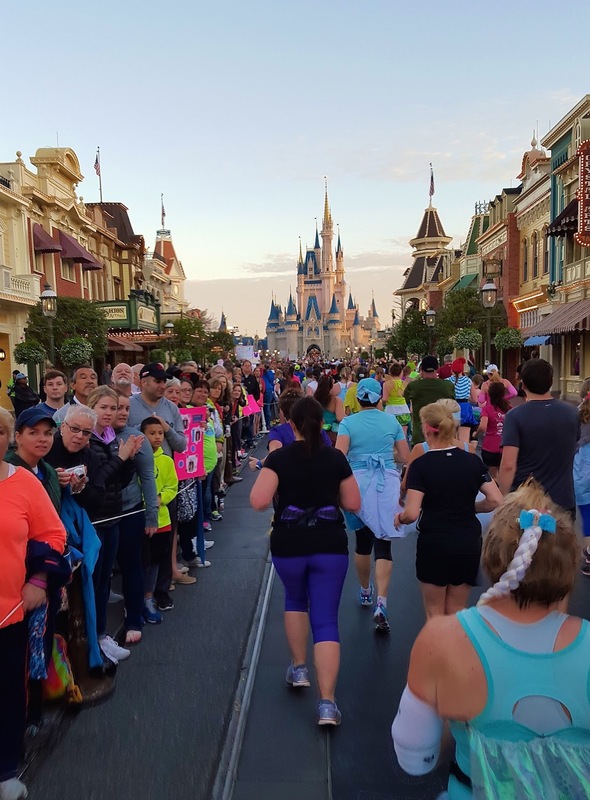 We spent the next two days at the parks, and before we knew it, it was time to wake up at 2:45am Saturday morning for the Enchanted 10k! We donned our race gear (my shirt, my socks, Mike's shirt) and headed to the buses. 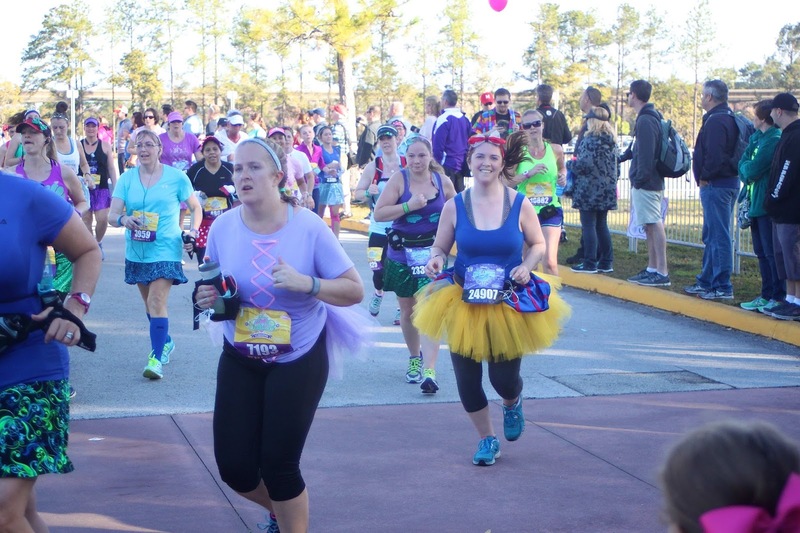 If you ever run a Disney World race, I highly suggest staying at one of their resorts. 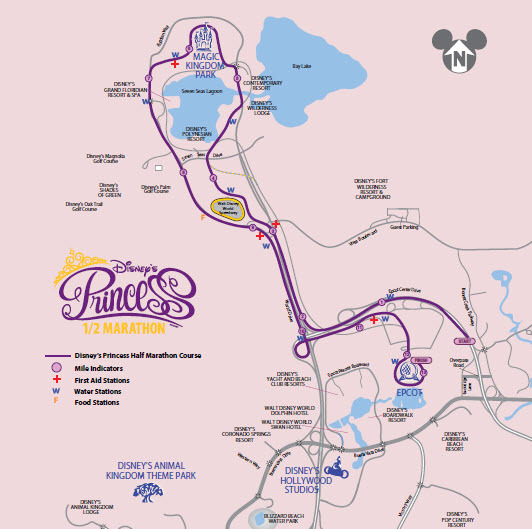 Many roads are closed throughout Walt Disney World on race mornings and parking is very scarce. There was no line for the bus, and we got to Epcot with plenty of time to take a few photos with characters and dance around before heading to our corral. At 5:30, the A corral began, and because they were super big corrals, we didn't start until after 6:00. We didn't really have a race plan, but I told Mike I'd run or walk however much he wanted. We set off out of Epcot and made a huge loop around their back lot. We saw a couple of characters (the witch from Snow White as well as Pocahontas and Meeko) but didn't stop. We were on a roll and before we knew it, the race was half over at the 5k point. Just after that, we entered Epcot through the Norway pavilion and headed around the world. Here's where we started seeing characters for which we wanted to stop. I'm all about the "rare" characters: those you don't see on a typical day visiting the parks. 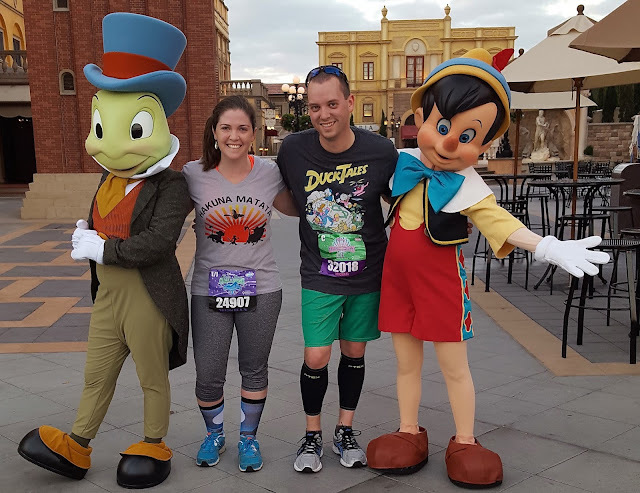 We chose to stop for Jiminy Cricket (who I'd only ever seen once before on Earth Day) and Pinocchio in Italy then for Lumiere and Cogsworth in France. After France, we turned left out of Epcot, towards the Boardwalk. 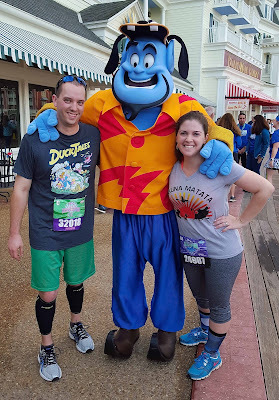 We kept running the whole Boardwalk loop (with only one stop to see Genie in his vacation garb - another character I hadn't seen before) and headed back towards Spaceship Earth. We did it! 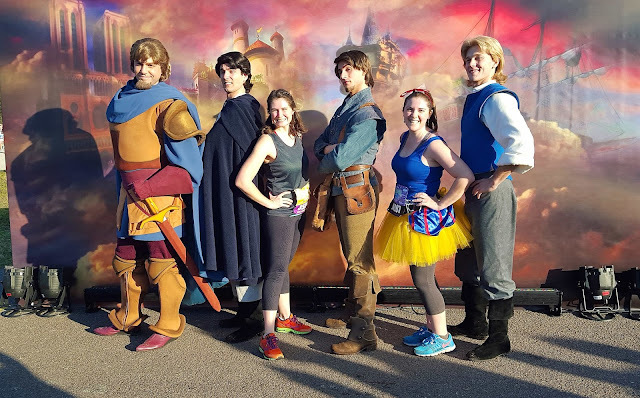 6.1 miles of running with only three stops to see characters. I was so proud of Mike! After some quick showers, we headed over to Animal Kingdom for the day and went to bed early because the running wasn't over yet! The second day of 2:45am alarms seemed even earlier than the first. I actually wore the same costume I wore for my Wine and Dine Half a couple of years ago, so getting ready was easy. Once again, I boarded the bus to head back to Epcot. 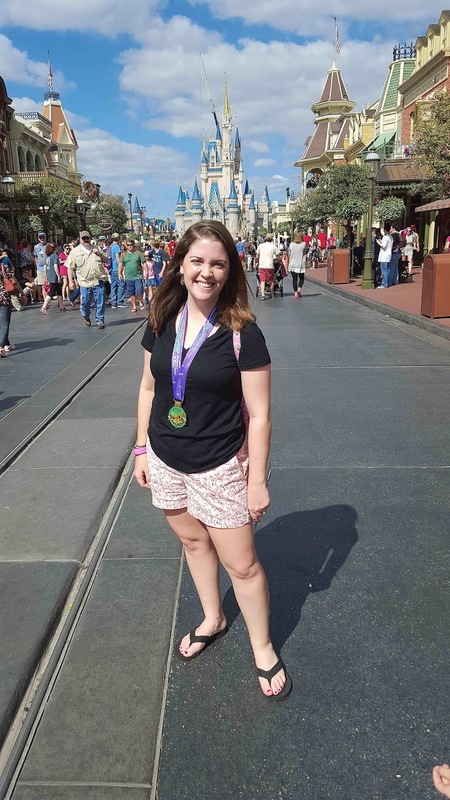 This course was actually 100% the same as my very first half marathon, so I knew exactly what I expect. 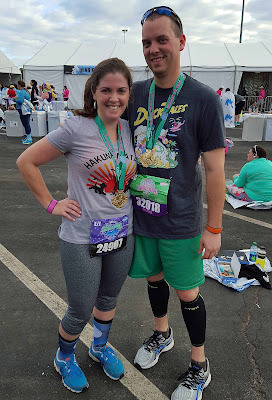 What I also love about this course is that all of it is along the monorail (Magic Kingdom and Epcot), so Mike could (get a couple more hours of sleep than me,) take a bus to Epcot from the hotel, and ride the monorail back and forth to see me at 5 different spots throughout the race. Well, before I knew it, I was 5:30 and time to start the race. The corral starts went by much quicker than with the 10k, and because I got there early, I got to be in the front row for my corral. After running the full 6 miles the day before, I wasn't really sure how the half would go, but I figured I'd take off running and see what happened from there. Miles 1-4 went by quickly, and I saw Mike at the transportation hub. By mile 5, I was entering the Magic Kingdom and hadn't yet stopped to see any characters so I was hoping for some good ones! Running down Main Street is my absolute favorite. Spectators are cheering, the music is blasting, and every runner is just so happy to have made it this far. The whole race experience could not have been better, but my only disappointment were the character photo-op choices. Like I said before, I like the rare characters, and Buzz, Anastasia and Drizella (Cinderella's wicked stepsisters), and Jesse and Woody (all who you can see any day in MK) were just not doing it for me. I was hoping for Prince Mickey and Princess Mickey or a whole slew of villains! Exiting the Magic Kingdom, we finally saw some princesses and their princes, but no joke, the line would have taken 20 minutes, so I kept going. Back around the Grand Floridian and Polynesian, right after the 10k mark, I saw Mike again. Well, he saw me. Thanks to the tracking texts he was receiving, he knew each time I finished another 5k. That gave me an extra push! 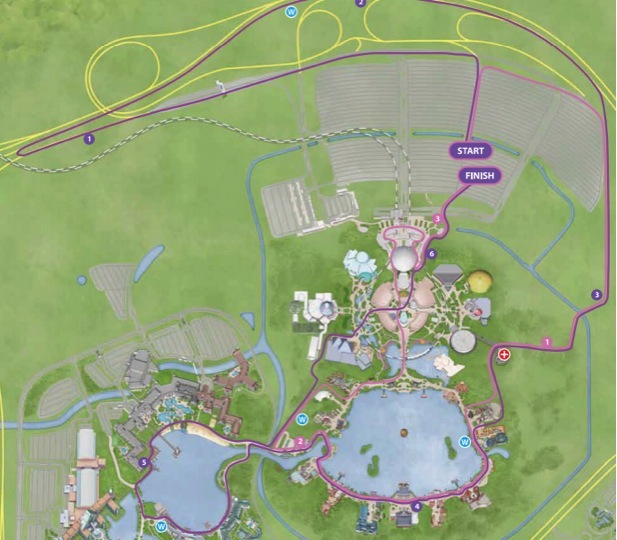 Now for the hard part, that long run back to Epcot between miles 8 and 11. The sun was in my face, and I was feeling those 6 miles from Saturday. I decided to finally stop for a character between miles 9 and 10 - the heroes! As I was waiting in line, Heather yelled my name. She was only a few people in front of me, so she dropped back so we could take a photo together! Luckily, the last mile through Epcot went by like a breeze, and before I knew it, the gospel choir at mile 13 was welcoming us to the finish line! I did it! 19.3 miles in 27 hours. After breakfast in bed (thanks, Mike) and a nap, we headed to the Magic Kingdom to celebrate! I'm so happy I ran the Princess weekend and came out with the Glass Slipper Challenge medal. If you are a Disney lover, you should definitely give this race a try! The weather is perfect this time of year and everyone at these events is always so happy. While I had an absolute wonderful time at this race, I am happy to report that I am officially retired from half marathons. 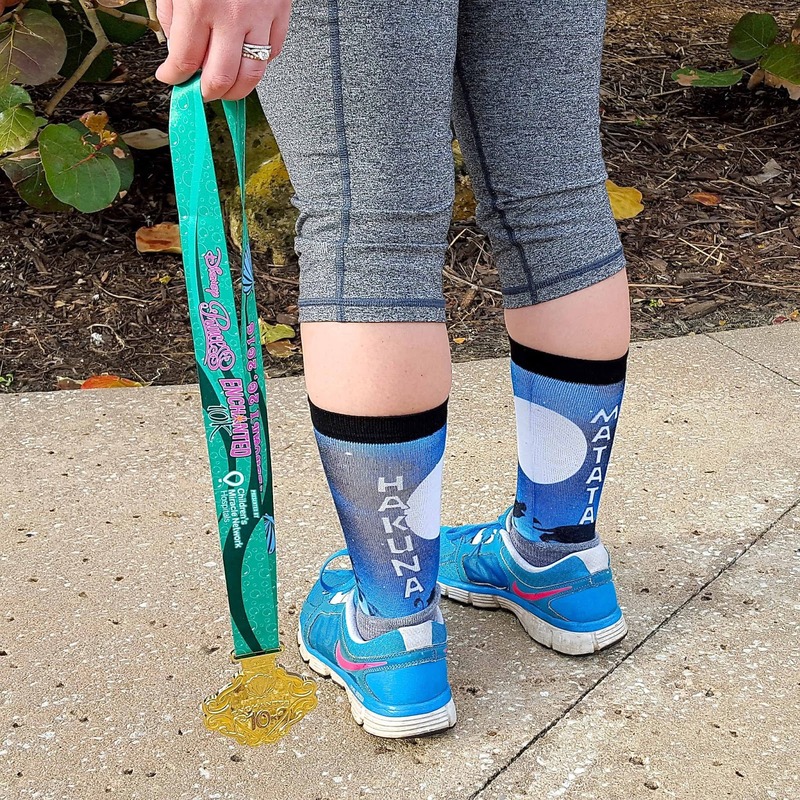 However, that doesn't mean I'm retired from runDisney. Mike had such a fantastic time during the 10k that he, too, now has the running bug, and we are hoping to head back to Disney World next spring for the 10k portion of the Star Wars - Dark Side Half Marathon weekend as well as Epcot's Flower and Garden Festival! My friend was at this race! It looked like a great time--so much fun! 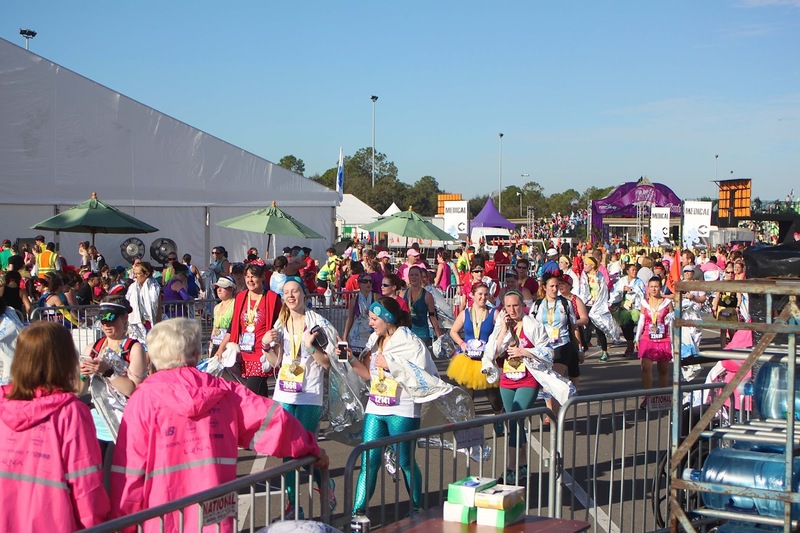 When does registration open for these races? I think Mr. Big Truck and I need to sign up for them for next year! Go, Meg!!! You are such a running rockstar. Seriously as I was reading about the half marathon after the run the day before my muscles started to hurt, ha! 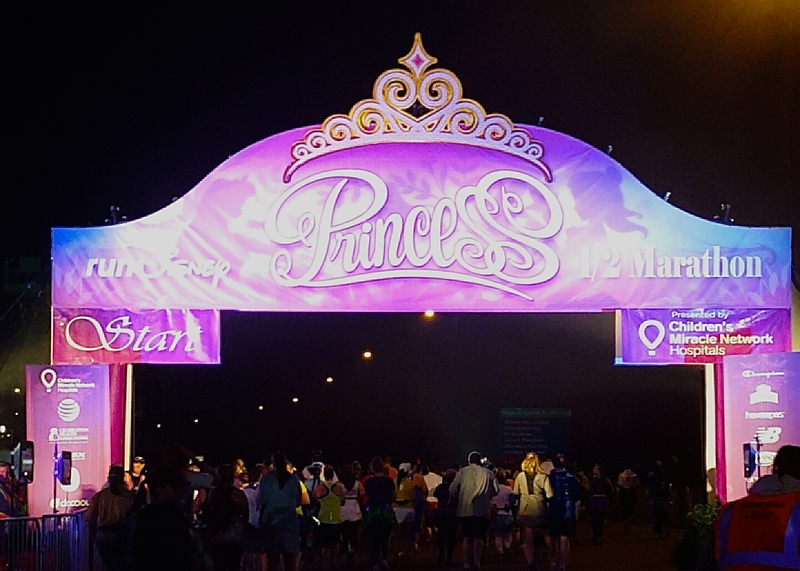 ;) The 5K on the Princess Half Marathon weekend was my first race ever, and now every time I try to run a 5K I am just really disappointed. Disney knows how to make everything special! Even a running race. I am totally fangirling over all of this! So proud of you! I honestly dont know if I could do those early wake up calls 3 days in a row PLUS a half marathon at the end. That's some serious work. YOU DID IT! Love your outfits - especially the SNOW WHITE!!! & You KNOOWWWWWWW I'm loving you Lumiere & Cogsworth pic! 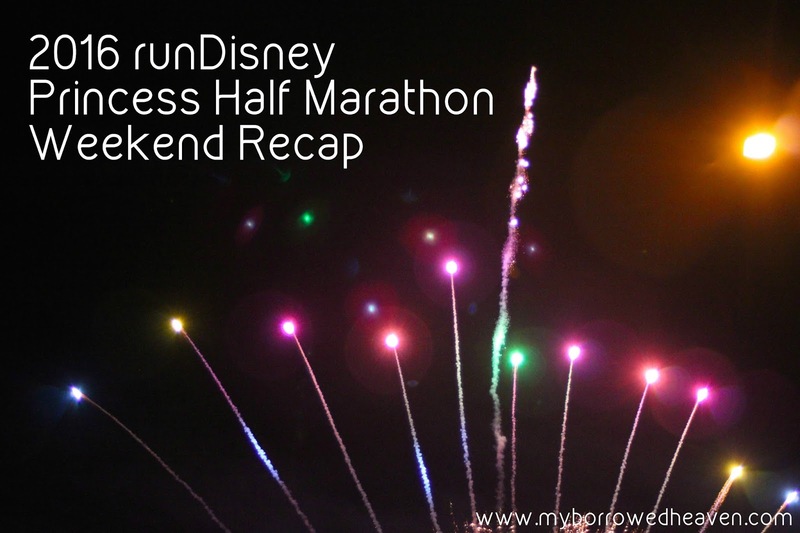 I cannot even begin to imagine running that much in one weekend (or ever, haha), but what a fun experience! So cool to see the Beauty & the Beast characters! One of my friends has done the price half a couple of times and it was always crazy to me how early you have to get up! I wish I was a runner just to do these races. So very jealous of the characters you met that aren't out much. Where did you stay? I'm so proud of you!!!! 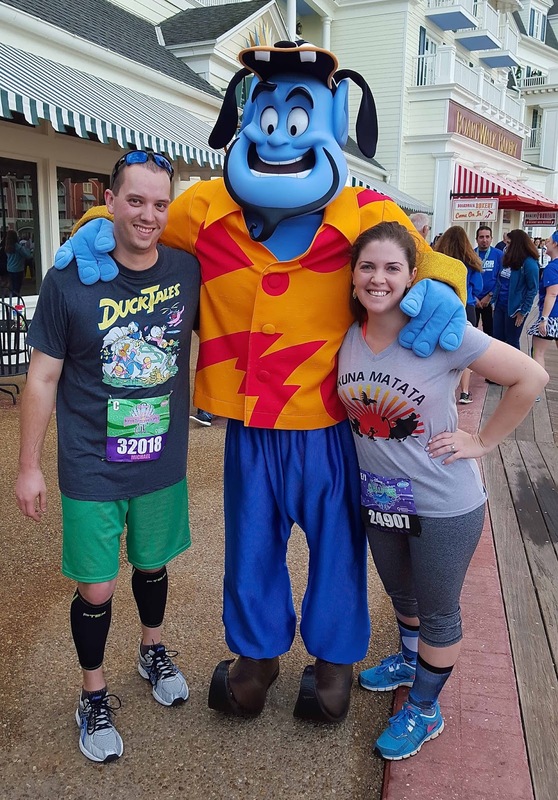 Running a Disney 5K and 10K are on my 101 in 1001, and I'm HOPING to do one in early 2017! 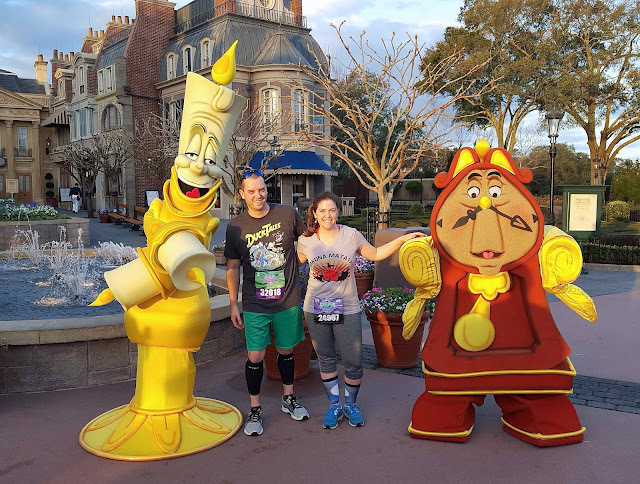 I love the picture with Cogsworth and Lumiere! That's awesome :). I saw Jiminy Cricket a couple trips ago (2008, I think), there was no special occasion or anything, it was just a random week in July, but he was in the Conservation Station at Animal Kingdom, along with Pocahontas (and possibly Rafiki but I can't remember). It's funny, the place was so empty that there was pretty much no line for Jiminy Cricket, and Pocahontas was actually standing there waiting for people. Andy and I were both like "let's just go take our picture with her, I feel bad." Haha. What resort did you stay at? Wow that's a lot of running! Go you! I love the outfits you wore for the races...So cute! Congrats on so many miles! I think I'd want to do the half first, and the 10k the next day. But then maybe you'd be more sore. Good job! Good for you girly!! 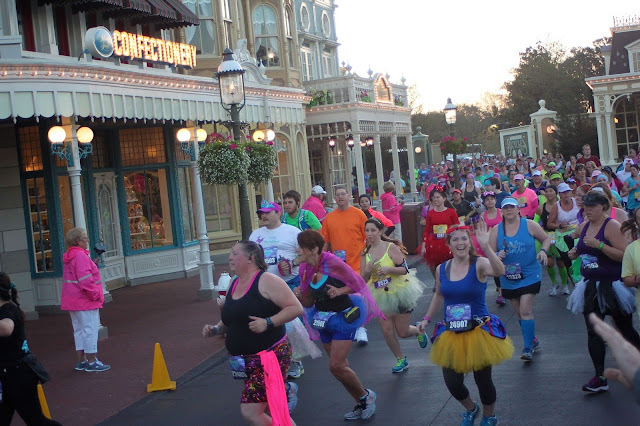 I bet that was so fun to do the race at Disney! Congratulations!! I want to run this next year! It's the weekend of my 30th birthday! This seems like such a blast! I'm not a runner but I would totally give something like this a try.